I love chocolate SO much. I don't really have many vices outside of dark chocolate. If i ever run out, I pretty much lose my mind. You can find me scavenging ritzy neighborhoods and artisanal bakeries for a sweet tiny morsel of the dark stuff. MMM. Yep. I'm insane. 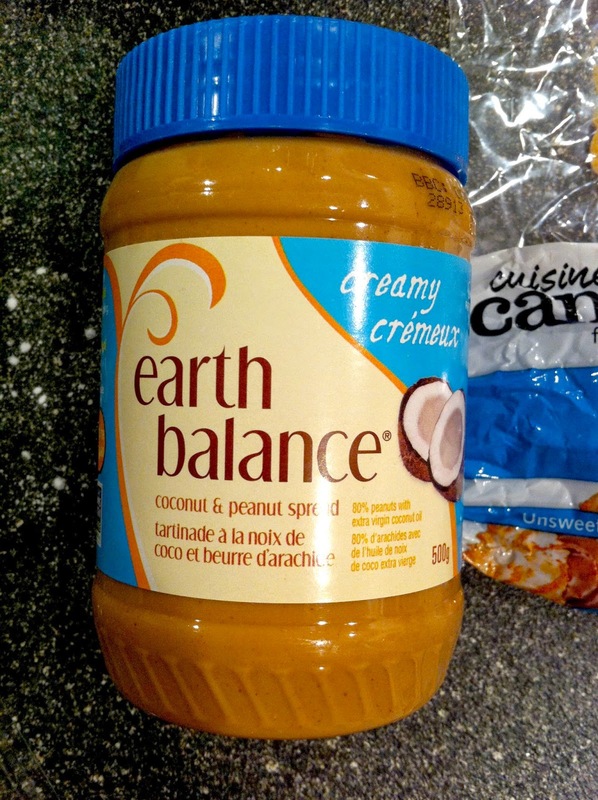 Coconut AND peanut butter? I adore this combination--and let me tell you, this stuff is GOOD. No sugar or weird ingredients and it has a lingering coconut oil flavour which I adore. Not a nasty weird coconut taste, just a subtle natural one! SO naturally...ba-da-bing-ba-da-boom! 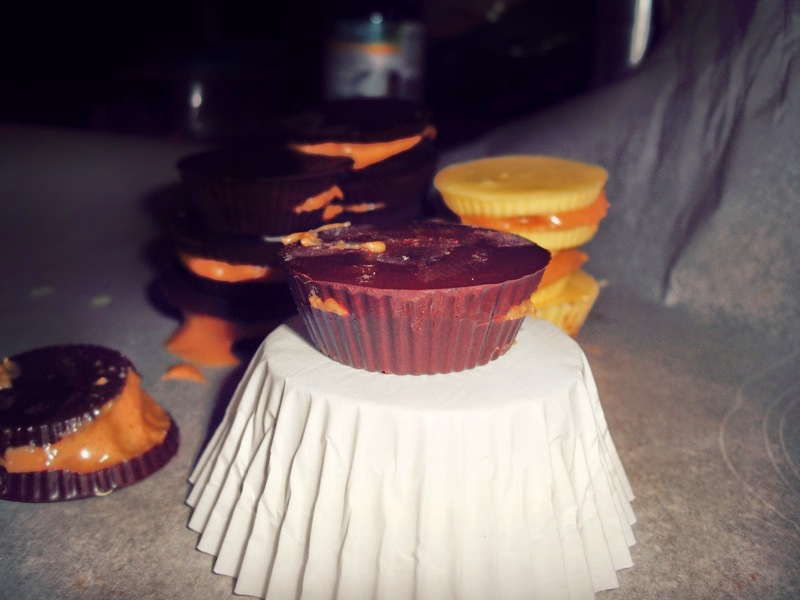 Peanut butter cups had to happen. So let's not delay, grab your chocolate and peanut butter and come with me!!! 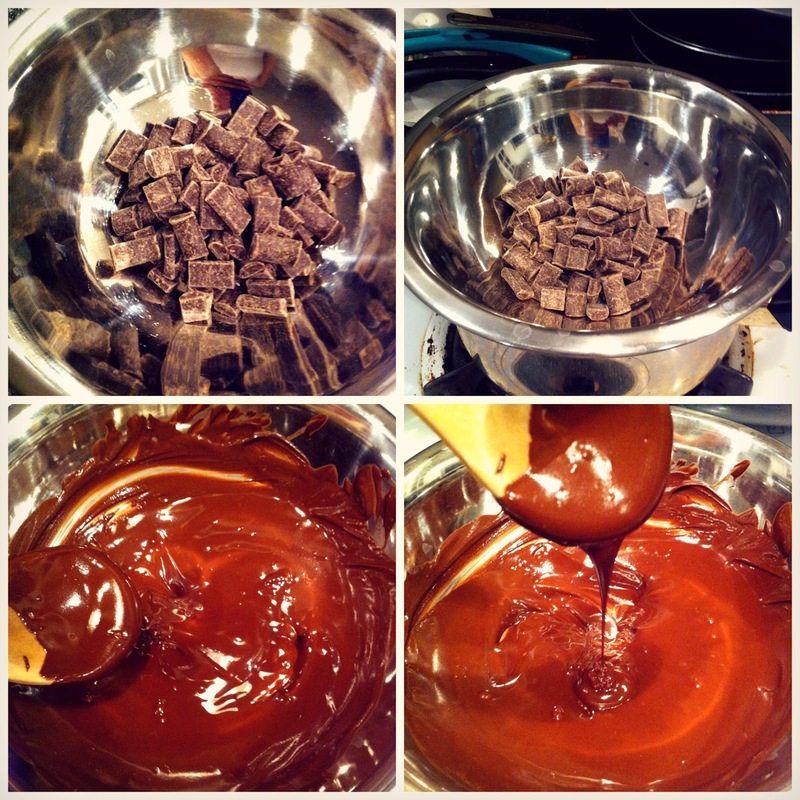 You want to temper the chocolate and then let it cool slightly. I used dark chocolate chunks! Sorry about the pictures of the process. I hate this phone for pictures and I misplaced my camera ! Oops! 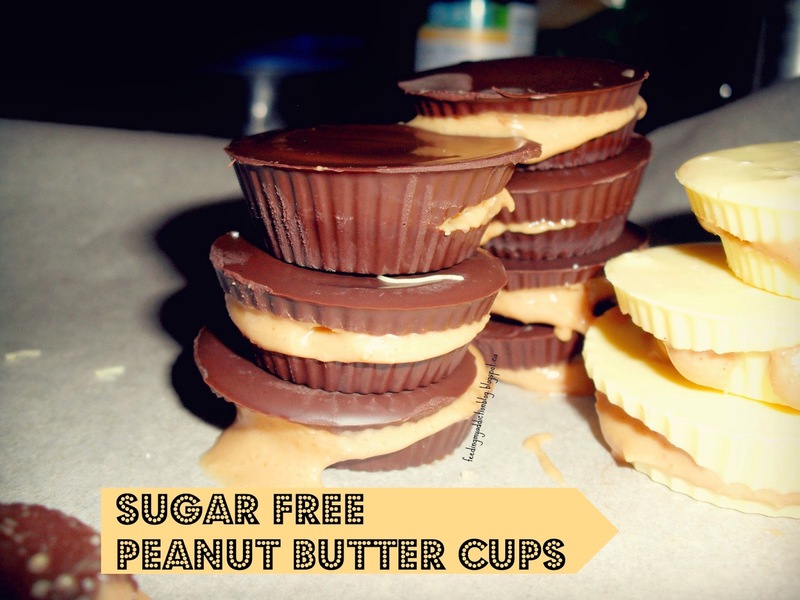 Conventionally, you would use peanut butter and icing sugar for a thick sweet filling. I used two packets of stevia. I then put it in a ziploc bag to make my life easier (again). 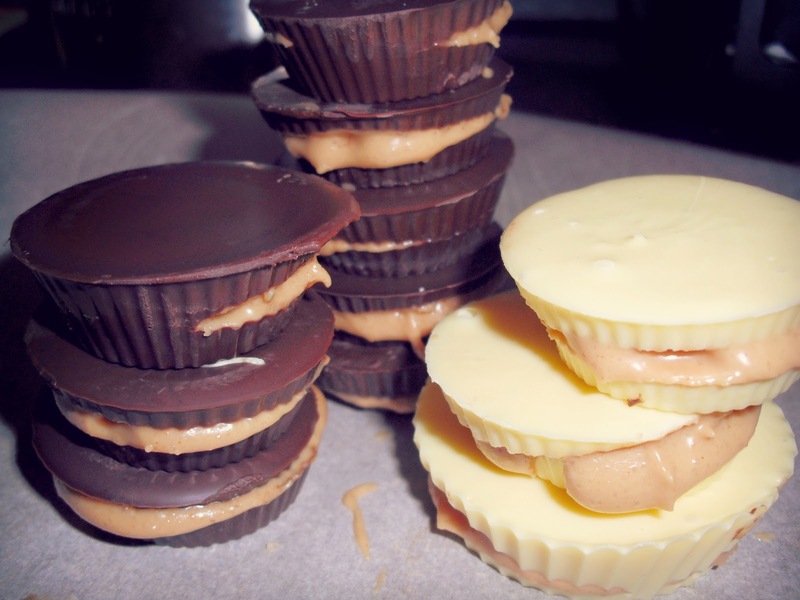 *NOTE* I would strongly advise you use something more substantial to make the peanut butter thick. Either peanut butter flour (I was out) or coconut flour. 1 tablespoon ought to do. Mine ended up leaking out--still delicious but avoidable and thus I thought I'd tell you! 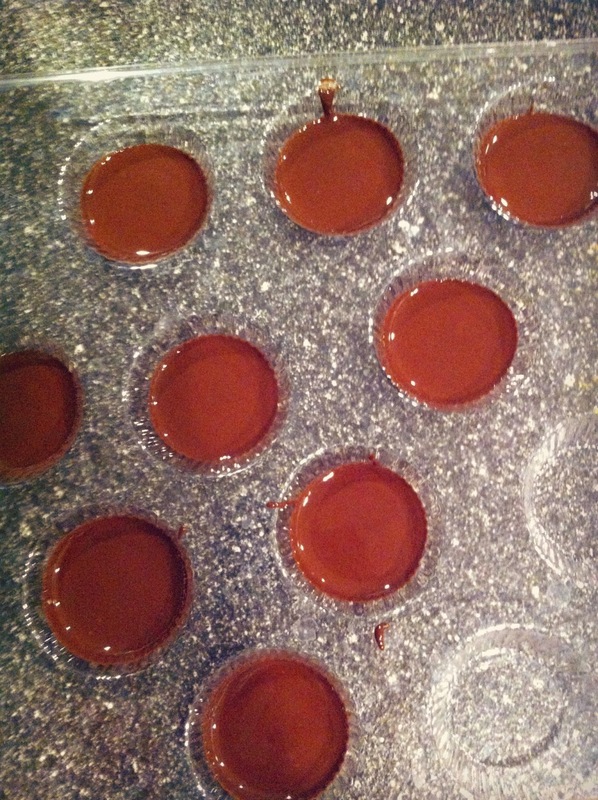 You want to fill your molds around 1/4 full of chocolate and tip upside down into a bowl to allow your chocolate to coat the sides. 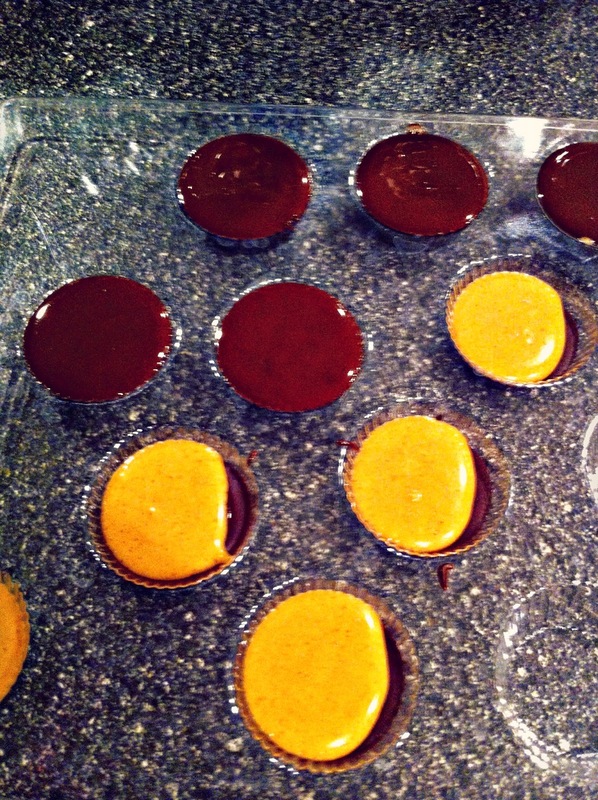 Or simply swirl the chocolate around the mold so it coats the sides. I DID NOT DO THIS and that is why my peanut butter kind of leaked out. 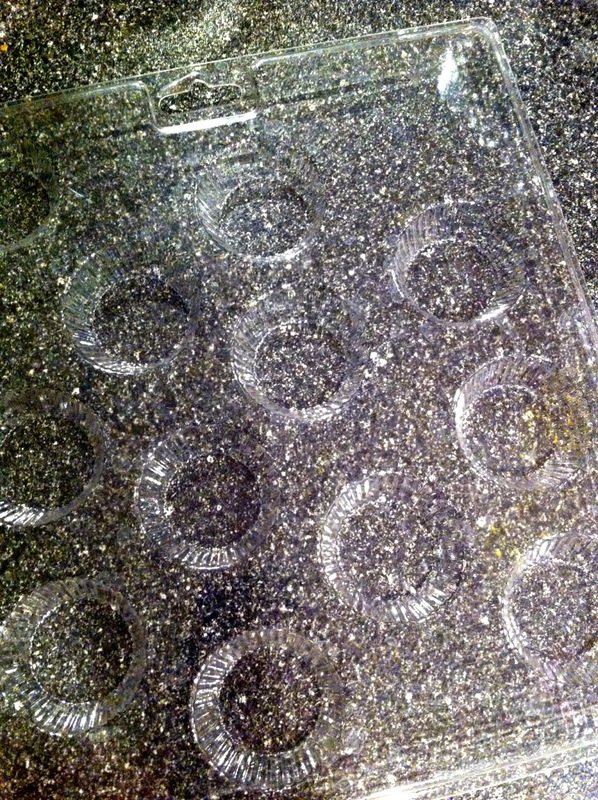 The ones coated on the sides did not have this problem! It was late and I admit I should not have been making chocolate..OOPSIE. 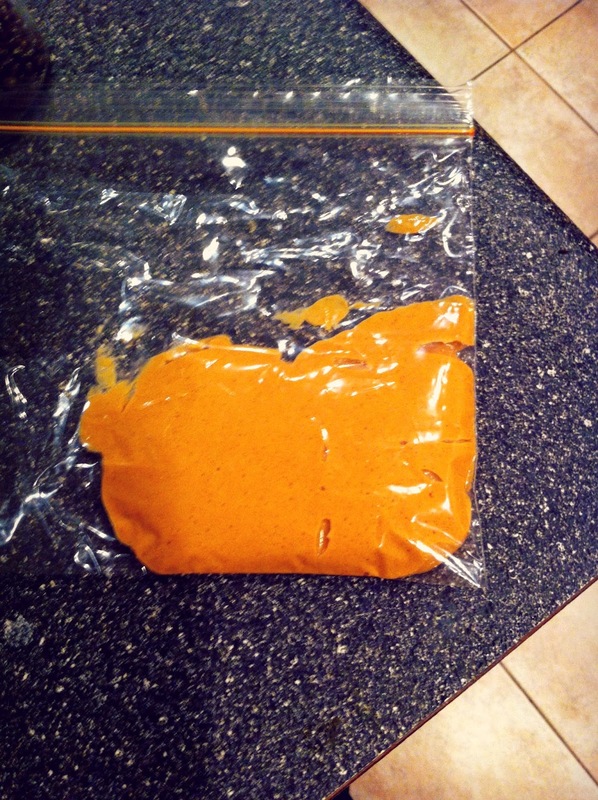 Put in the fridge or freezer until it sets and becomes matte. 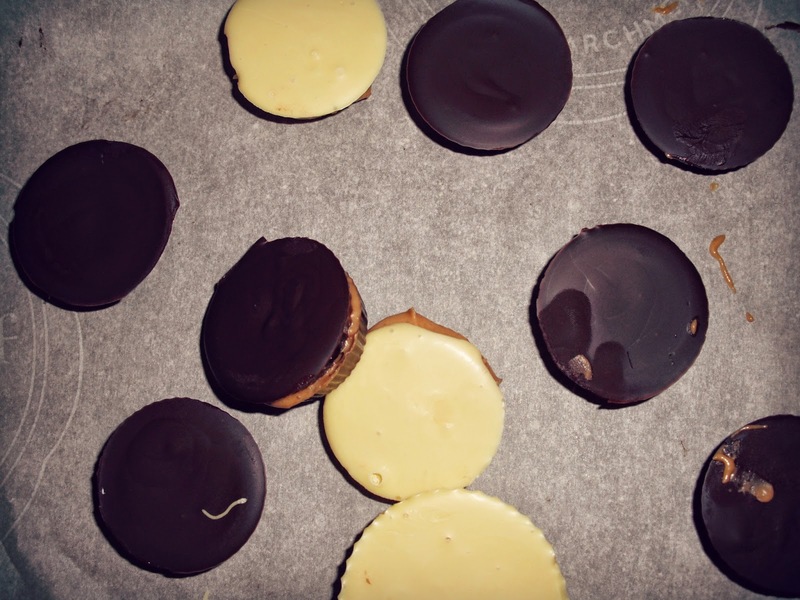 Now you can add your filling and top with chocolate until your molds are full. 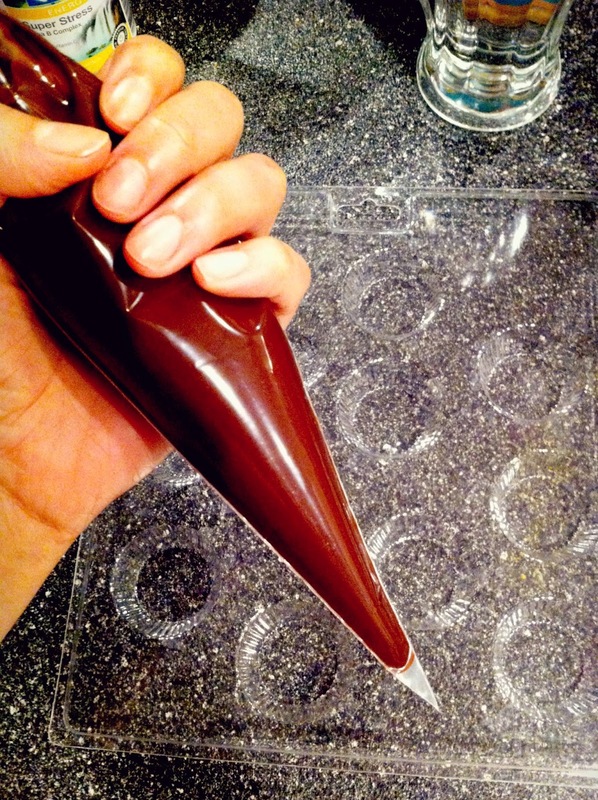 Tap them to make sure your chocolate is nice and flat and there are no air bubbles. Pop these in the fridge or freezer to set for 5-10 more minutes. Pop them out of the molds and enjoy! I ran out of dark chocolate so I did a few white chocolate ones--those are NOT as low in sugar. Pretty, though! Hope you try these and remember my recommendations for a more successful attempt than I had. It's no biggie either way, because these taste really good! And I like a good snap to my chocolate so keeping them in the fridge is my preference. Otherwise? Keep them in an airtight container! They won't last long no matter where you hide them! I hope you stay tuned for some more healthy treats--I am working on something special AS WE SPEAK! 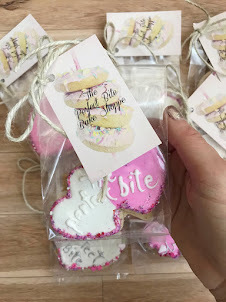 And more pretty decorated cookies to come, too!